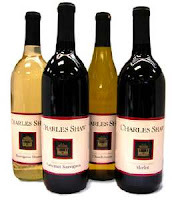 Two Buck Chuck is celebrating its fifth anniversary and there are no signs that the dirt cheap Charles Shaw label is going away. Rebel winemaker Fred Franzia has produced over 300 million bottles of cut-rate Chardonnay and Cabernet over the last 5 years, shaking up the wine business in the process. The economical juice can only be purchased at Trader Joe’s and — beware — it can cost you over three bucks in some states.